Tag line: "Whoever saves one life, saves the world entire"
Trivia: Steven Spielberg was not paid for this film. He refused to accept a salary citing that it would be "blood money"
As I think back on the events of Schindler’s List, I find it nearly impossible to write a routine analysis of the film. It just doesn’t feel right addressing the movie on a technical level, discussing its marvelous performances or hauntingly effective black and white imagery. Schindler’s List is too powerful to be reduced to a few standard observations. More than the sum of its cinematic achievements, Schindler’s List is an emotion, a feeling, a reaction that forms deep inside and slowly claws its way to the surface. It’s 1941, and German entrepreneur Oskar Schindler (Liam Neeson) has traveled to Nazi-controlled Poland to seek his fame and fortune. A smooth talker, Schindler bribes the necessary Nazi officers, and before long, has a contract to manufacture pots and pans for the German army. In order to save on labor costs, Schindler employs Jews from the Krakow Ghetto, and even hires a Jewish accountant named Itzhak Stern (Ben Kingsley), to handle the day-to-day operations while he himself womanizes and cozies up to Nazi officials. For a time, business was good, with Schindler making more money than he ever imagined. Not even the arrival of Amon Goeth (Ralph Fiennes), the new commandant of the area and a vicious, murdering thug, can stop the money from pouring in. But even Schindler can't hide from his own conscience, which gets the better of him after he witnesses the atrocities committed by Goeth and his men against the Jewish inhabitants of the Ghetto. With his eyes suddenly opened to the brutality of the regime he works for, business becomes a secondary concern for Schindler, who teams up with Stern to save as many Jews as possible from the Nazi's “final solution”. 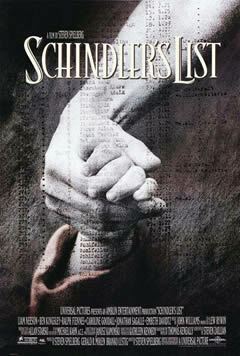 My initial experience with Schindler’s List was an eye-opening one. For most of my life, my knowledge of the cruelties that were committed during World War II went no further than a textbook account of what transpired. With Schindler’s List, Spielberg has provided a fresh, disturbing perspective, giving faces to the names and showing the suffering, not to mention the humiliation, these men, women and children were forced to endure. I was beyond shaken; I was devastated, and years later, it still remains a gut-wrenching motion picture. Schindler’s List is much more than a film; it’s an awakening, a window overlooking a tragedy that, for the longest time, I was only too happy to ignore. Now, the images of these terrible events are forever etched into my mind. Exceptional film. This is the only movie I have ever seen where the audience left the theater silently, lost in their own thoughts. Thanks for including it. Aaron: Thanks for stopping by, and for the comment! I didn't get a chance to see this one on the big screen, but I can only imagine that's how most audiences would have left the theater. This is a film you need to digest before you can even start discussing it with others. An overwhelming expedience. This is the picture that won SS the Oscar. A piece of cinema history. @Julian: It is certainly that... overwhelming, and often quite brutal. But definitely a classic. Some years ago I met and spoke to Zbynek Brynych who wrote and directed TRANSPORT FROM PARADISE, a Czech film about the Holocaust. SCHINDLER'S LIST had not been out that long and Brynych was still a little upset that Spielberg had lifted images and sequences that Brynych had shot for his much earlier Holocaust film. He told me that Spielberg had called him once to say that he'd seen and enjoyed TRANSPORT, but had said nothing about the sequences he'd borrowed for LIST.